Hey! Hope everyone is having a good week so far! Today's outfit is my rendition of what I like to call the cotton candy pairing aka a playful pink and blue combination. I'm always a bit hesitant to pair lighter pinks and blues together because of the aforementioned cotton candy syndrome or the fear of having it appear too much like a baby shower...lol. However, it's always fun to take one of these tricky combinations and create a chic outfit. I picked up these bright blue pants last summer from Madewell and I wanted to see what other pairing I could come up with aside from just a plain white. 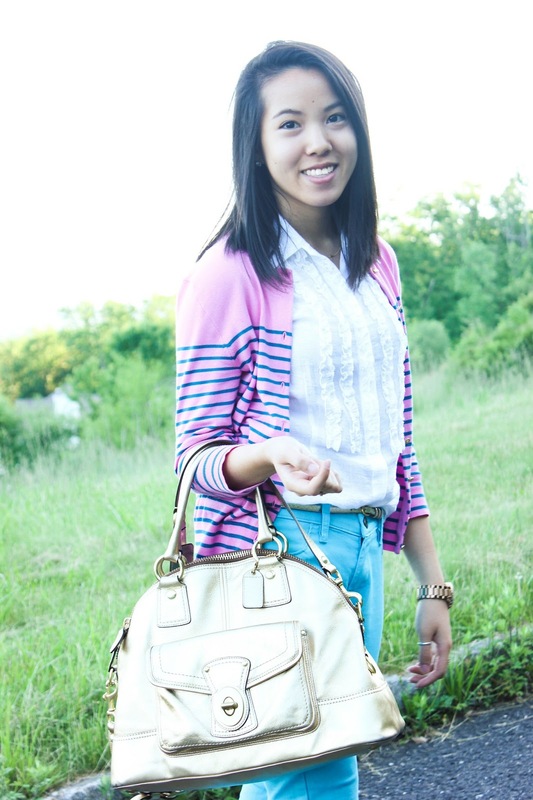 I love this Jackie cardigan from J.Crew, particularly for its adorable gold anchor button, and it made for a pretty cute match overall with the minimally ruffled top! Unfortunately, the one I have is all sold out, but they do have other colors both online and in-store. What are some color combinations that you are hesitant to try out? Let me know in the comments below! 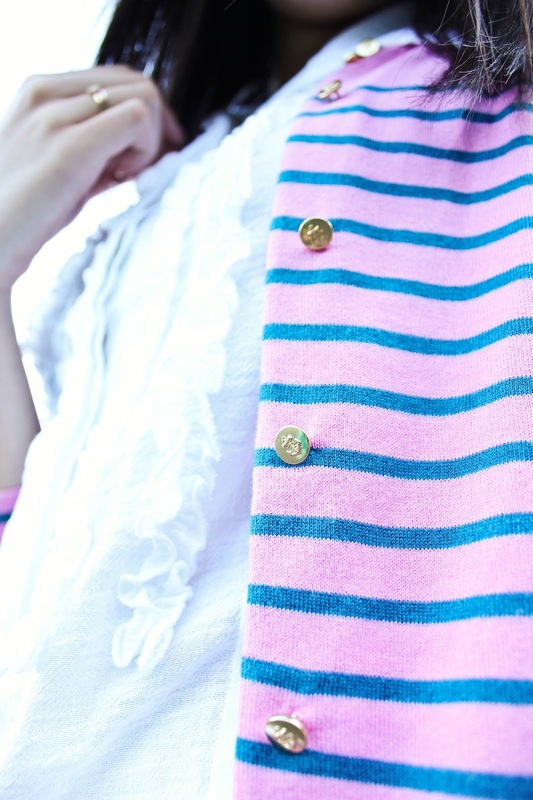 Really adore those anchor details on the gold buttons. Although the colors might resemble cotton candy, I actually like it, I think the stripes gives the outfit a preppier feel to it, so it isn't just straight on pink & blue & some cotton candy lol I think one color combo that I'm afraid to try would probably be Purple & Green, something about it just reminds me of the Hulk lol I know it's silly, but whenever I accidentally pair the two together, I always change my mind because I'm reminded of the Hulk.. how odd am I? Thanks Christine! :) Lol at your Hulk reference! I totally also fear purple and green, but instead of the Hulk I either think of Mardi Gras....or Barney which is much much worse hahaha. aawww you look so charming in this! :D love the button details!! such an adorable outfit you put together! and you definitely do not look like baby shower ;) I'm especially loving that cute striped cardigan.